Winter Planting – Dig Delve – An online magazine about gardens, landscape, growing & making. The hush and the breathing space that comes, now that the leaves are down and the grass has finally slowed, is palpable. In the mild spells between freezes I take this opportunity to square up the holding area by the barns. This is where one day I plan for a greenhouse, but for now it is where I propagate and look after the plants that are waiting for a home. The cold frames which reared the spring seedlings are now packed to the gunnels with plants that need protection from the lethal combination of winter wet and freeze. 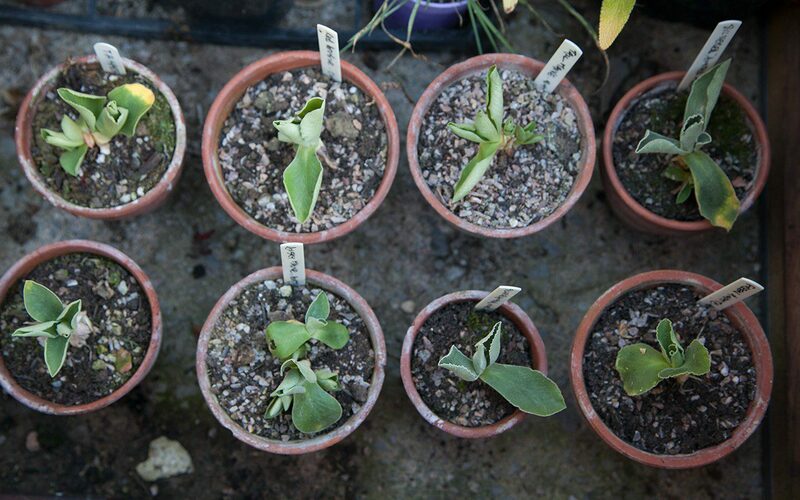 Auriculas and the Mediterranean herbs are kept on the dry side and the autumn seedlings and cuttings will make a surprising leap forward with this little extra shelter. 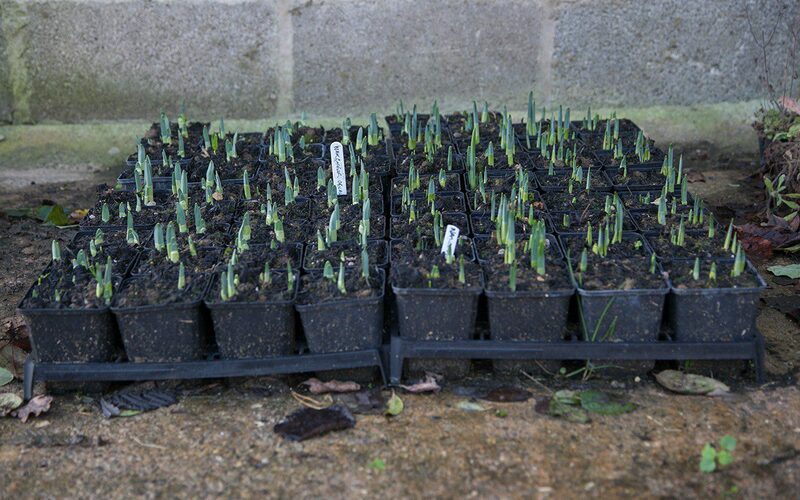 Out in the open and hunkered together for protection are bulbs to go out in the spring, once I can see exactly where they need to be and that they are the correct varieties, as well as youngsters that are ready and waiting for areas that are not quite prepared in which to set them loose. This backlog is a perpetual conundrum, but I have a three-year rule so that the holding ground avoids becoming a corner of shame. If they cannot be found a place, they will be put out on the lane with a sign saying, “Please help yourself”. Very few are left unclaimed and I trust they find good and unplanned for new homes. It is always good to start the year by planting trees and I am happy to use this window in the season to liberate the chosen few so that by the end of the holidays I am organised and ready for a new year. 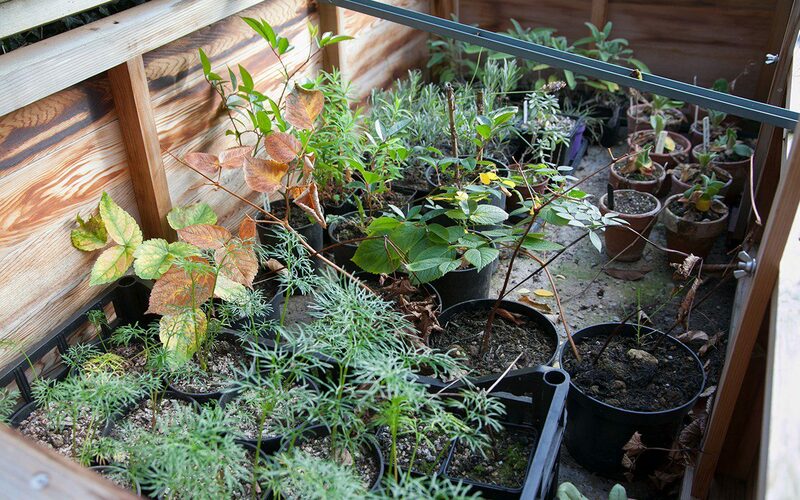 If they have been potted on annually, the woody seedlings are just about perfect at the end of a three-year period. This year, the first to be liberated will be the small-fruited form of Malus hupehensis, which were grown from the fruit of the single plant I have up in the blossom wood and are ready now to make the leap into open ground. The seedlings are part of the learning curve that is illustrated in the trees they are going to join and in part replace. Destined for our highest ridge above the house, I plan for a huddle of berrying trees that will burst a cloud of blossom against the skyline in the spring. Three plants will join the hawthorn that were frayed out into the field from the Blossom Wood and the fourth will replace an ailing Malus transitoria. I have staggered this small, amber-fruited crab up the slope to meet the Blossom Wood on the high ground, but I have obviously pushed this Chinese species to the limit, for the higher up the slope they go the weaker they become, despite the fact that it is reputed to be resistant to drought and cold. With barely a finger’s worth of growth in the five summers they have been there, compared to several feet on those lower down the slope, they have demonstrated exactly what they require in the time they have been there. I have dutifully mulched and watered and fed, but five years is quite long enough to know if a plant doesn’t like you, and so I feel justified in making the change. As I mature as a gardener, the question of time becomes more acute. I want to spend it wisely and use my energy well which, when you are investing years in trees, is important. 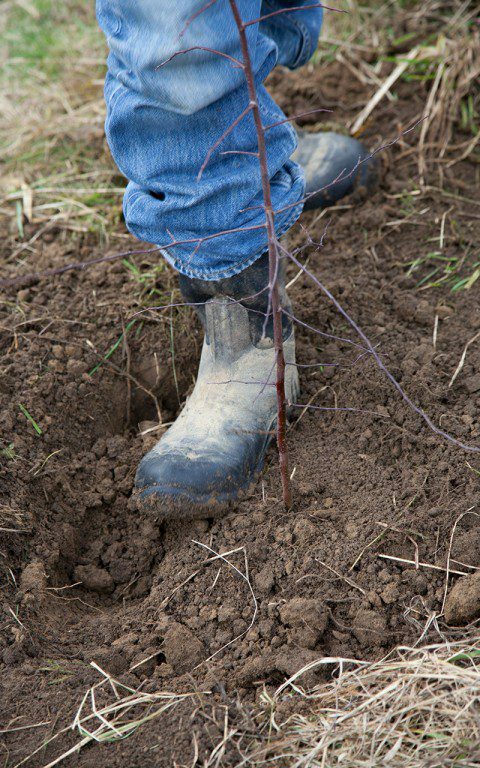 That said, I am happy to plant young and though the saplings are barely up to my knee, they have the vigour of youth and will jump away with the below-ground growing time of winter ahead of them. The Malus hupehensis further up the slope has shown me that it has the stamina its cousin doesn’t and it is a good maxim that if you fail with one species, try another before giving up entirely. 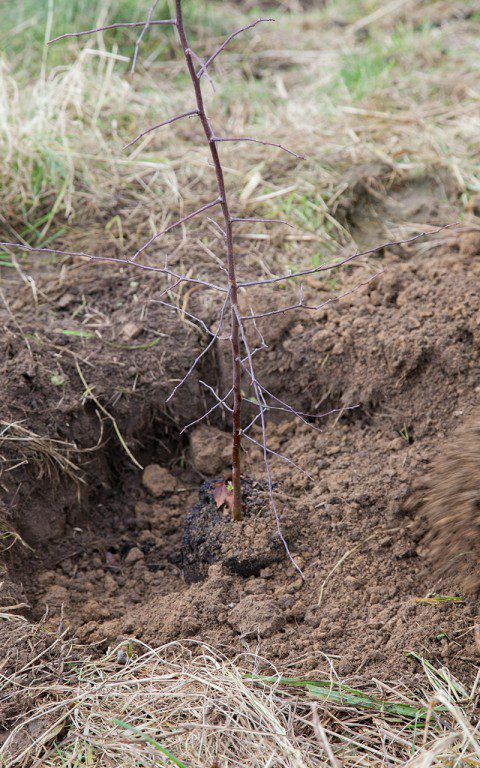 When planting woody material, and trees in particular, I prefer not to include organic matter to avoid an enriched planting hole from which the young tree prefers not to venture. Instead, the top sod, where the best soil lies, is upturned into the bottom of the hole where, by spring, it will have rotted down to provide the young roots with a good layer of loam. 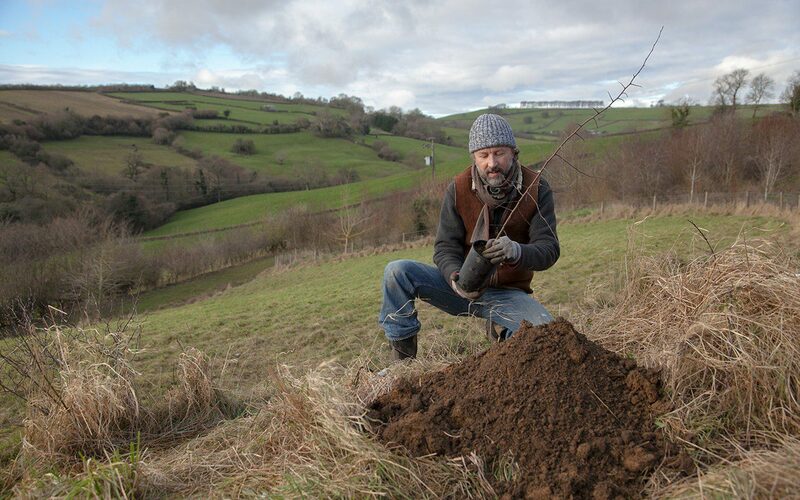 The roots of the young trees are given a sprinkling of mycchorhizal fungi to help in their establishment and from here they can make an easy way out into the surrounding ground. If I am to add compost, it will be as a mulch to keep the moisture in and the weeds down, and, in time, the worms will pull it to ground. Three years of clear ground around the base of a new tree is usually enough to give it the chance to get the upper hand and for the competition not to stunt growth. Growth which, in the case of my young Malus, and now that they have been liberated from the holding ground, will have nothing to hold it back come spring.